1 What is a Fish Lip Gripper? 3.1 Why Would You Use a Fish Lip Gripper? 4 How Can a Fish Lip Gripper Help Handle Fish? Have you ever been fishing and caught a monster catfish and had to lift up your catch without gloves or a lip gripper? Most people when they are lifting a large fish out of the water will lose the fish when it tries to get away and fights the angler. My fish lip gripper of choice is the Boga grip 15lb. With a pair of lip grippers, the threat of losing your fish is essentially nonexistent. Most lip grippers grab and do not let go unless the angler releases the teeth of the gripper. What is a Fish Lip Gripper? A fish lip gripper is a tool that clamps two jaws around the lip of the fish being caught. Ensuring the anglers hands do not have to reach into the fish’s mouth where there could be teeth or very rough toothy patches. Paired with a very strong jaw depending on the fish. This keeps the angler from putting his/her hands in harm’s way. as well as keeps the fish from getting away while thrashing violently in an attempt to escape into the depths. Yes, a net or gaff works wonders. However, the gaff is mainly for the angler looking for food and not to catch and release. As well as a net can become very cumbersome in a smaller vessel or kayak. Some of the higher end fish grippers are equipped with a scale to quickly weigh the fish and ensure a proper release. Fish lip grippers come in a variety of styles. The small grippers which are softer aluminum and plastic with entry-level springs in the jaws are for average fish. Some models include a 30 lb scales. 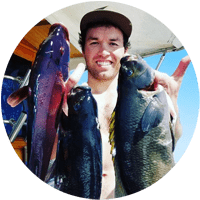 The more expensive to the larger models made of stainless steel with very strong springs in the jaws are for some of the larger saltwater fish. These can include scales ranging up to 100 lbs. 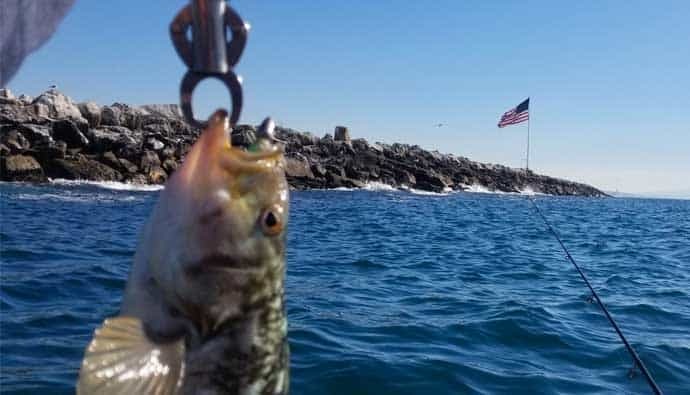 Fish lip grippers help anglers handle fish safely. They are also a better way to handle fish. When most people catch a bass they ‘lip’ the bass which means they hold the fish by the bottom lip and allow the fish’s body to make an arch. This is bad for the fish as it stretches the spine of the fish and hurts the fish greatly. When the fish is released it’ll have a very low chance of surviving due to the spine of the fish having out. This can in turn damage the nervous system in the fish’s body which will lead to the fish perishing. Essentially, all fish lip grippers are the same. The different models and types have various triggers that open the jaws of the lip gripper. They either have a button or a switch you can press that locks and holds the jaws in place. In other models, it is as simple as engaging the trigger to open the jaws. When the jaws are around the fish’s mouth releasing the trigger and the spring will hold the jaws on the lip of the fish. Once you finish handling the fish all you have to do is return the fish to the water and release the jaws of your lip gripper. The fish will swim away without incident. Why Would You Use a Fish Lip Gripper? There are various reasons to use a fish lip gripper as noted earlier. This tool helps and aids a fisherman in holding the fish to keep it from getting away when the fish thrashes violently. It makes sure the fisherman has a good hold on the fish when attempting to take the hooks out of the fish’s mouth. Grippers help to keep the hooks from the lure from snagging the angler in the hand as well. Fish lip grippers are good for fish and help keep an angler from damaging the nervous system when handling the fish. This can be ideal when removing hooks or when taking pictures of a trophy catch! Some fish grippers also come with a scale which keeps the fish from slipping off of the hook on conventional scales. This has happened to me personally more times than I would like to admit! How Can a Fish Lip Gripper Help Handle Fish? A fish lip gripper helps handle fish when pulling them out of the water. As well as gives the angler something solid to hold onto when extracting the hooks from the fish’s mouth. They also aid in keeping specific species of fish such as trout from being damaged when handling. This is important in case an angler forgets to wet their hands before touching the fish. This could remove the slimy layer on the fish which will lead to the death of the fish. Imagine pulling in a 100 lb catfish and having nothing but the good lord between you in order to handle the fish and removing the hook from the fish’s mouth. 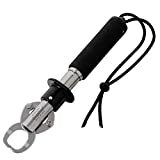 A pair of lip grippers will aid and keep the fish from getting away as well as keep your hands out of the mouth in case the fish decides to clamp down on your hand. Which is as good running your hand against a belt sander going full speed. Rapala has been around for ages and has made quality fishing products. This fish gripper is no different. It’s simple in its design and made of plastic so you won’t have to worry about rusting. Plus it super cheap and can help you carry the big fish you catch out on the water. If you don’t need a scale then this is the best gripper for you. I know a few fishermen who swear that this is the best catfish gripper around. If you’re looking to take detailed notes about how much your fish weighs, then it’s important you get a Boga Grip. If you plan to file for any IGFA records, then this is the best tool for the job. Just remember to send it in to them to get certified. It’s well built and doesn’t rust. I have one and love it. It’s worth the money and can be passed down from generation to generation. I have personally been in many situations and have needed a pair of fish lip grippers. Whether I am running fishing lines for monster catfish or turtles in ponds, on a flat bottom, or fighting massive striped bass in the larger lakes around me, a pair of fish lip grippers has come in handy in every situation the requires handling a larger fish or an aquatic animal that could easily take a finger off with a simple bite. Fish lip Grippers are an essential tool for the modern fisherman or any fisherman as a matter of fact. They help an angler in a clean catch and release as well as keep an anglers hands from having to lip a feisty bass, walleye, pike or crappie. These tools are most indefinitely one of the most important tools for a fisherman. Q: Do Fish lip grippers come with a scale? A: Most fish lip grippers come with a scale as well as cheaper options that do not and are just jaws that help you hold your fish. Q: What are the different sizes of fish grippers? A: The sizes range from small which are rated up to 3 lbs all the way up to 100 lbs. Q: Can a lip gripper damage a fishes mouth? A: A fish lip gripper does not damage a fishes mouth. Most all lip grippers have very round and smooth jaws that do nothing more than clamp both sides of the fish’s lip. Q: What are the differences between lip grippers? A: There are many different shapes and sizes between lip grippers. 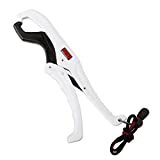 They can come in a T shape, pistol grip, as well as a simple plier style in the cheaper variants. Most all fish lip grippers are the same per advertised strength in they all use a strong spring to hold the jaws closed. Q: Do fish lip grippers float? A: Some models of the plastic fish lip grippers float. However, if you purchase a metal pair you can expect them to sink. Most of the metal variants come with a lanyard and a carabiner clip to attach them to your pants or pack.